Tanna of the first generation; pupil of R. Johanan b. Zakkai (Ab. ii. 8), and son-in-law of R. Gamaliel I. (Tosef., 'Ab. Zarah, iii. 10). He belonged to a noble priestly family; and his teacher, R. Johanan b. Zakkai, praised him for his piety and his fear of sinning (Ab. l.c.). Simeon held that the most important habit to be acquired by man is that of carefully considering the consequences of each one of his deeds; while the worst practise, which a person should be careful to shun, is that of not paying one's debts (Ab. ii. 9). 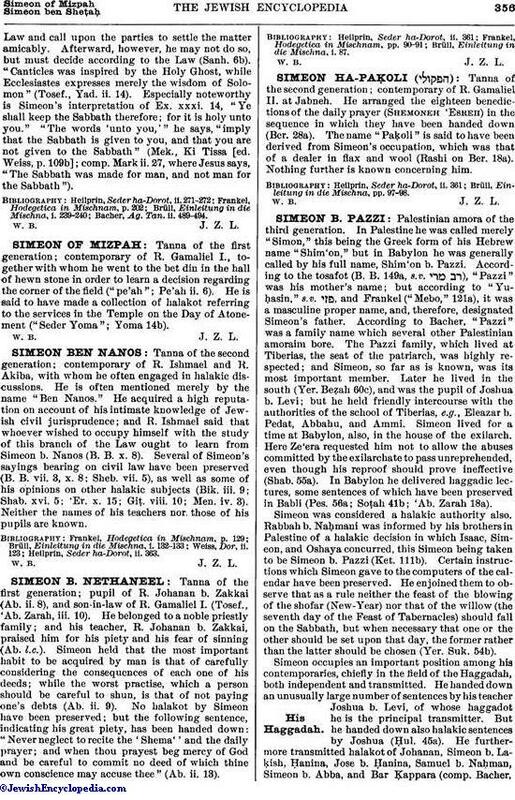 No halakot by Simeon have been preserved; but the following sentence, indicating his great piety, has been handed down: "Never neglect to recite the 'Shema'' and the daily prayer; and when thou prayest beg mercy of God and be careful to commit no deed of which thine own conscience may accuse thee" (Ab. ii. 13). Brüll, Einleitung in die Mischna, i. 87.